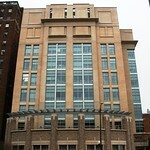 Opened in 2009 by Virginia Commonwealth University (VCU), the Molecular Medicine Research Building is an eight-story, 125,000 square-foot research facility occupied by 48 principal investigators and their staffs. Within the building's state-of-the-art research labs, researchers work to transform our understanding of illness and disease and uncover new therapies and cures. Such advances have the potential to improve clinical care for patients in the City of Richmond and across the country. The facility also anticipates LEED certification from the U.S. Green Building Council. Energy conservation features include, water-efficient fixtures, an energy recovery wheel in the air handling system that captures and re-uses heat energy, and a green roof on the second floor terrace that helps to reduce storm water runoff.